Occurs immediately upon your return to Bob's 1 after being rescued by the aliens. Bob's assisstant will tell you that you'll need a specially fitted Moth to enter the Port Crater. You're only five quick steps away from getting off of Titan. You need to find one of Psycho Bob's technicians named Syd. You may have seen him in the video at Psycho Bob's 2 when you should've been at Psycho Bob's 1. Your immediate instructions are to go to Psycho Bob's 2. Psycho Bob's 2 -- Target Trade Central from your Local Services Menu while still in Psycho Bob's 1. Psycho Bob's 2 is in the Trade Central complex. Fly toward Trade Central's hangar door and you'll see Psycho Bob's 2 just to your left past Downtown Estates. Try to enter Psycho Bob's 2. Your entry will be denied and you'll get a message about how the scoundrels of Psycho Bob's 2 have been arrested. Psycho Bob's 2 will be closed throughout the rest of the game. Don't bother reading the message, head immediately for the Gamma Crater and then to Midway. Prison Oubliette -- Sometime around the the time you get into Midway you'll get a mission with a subject entitled *Rescue Prisoner*. It seems that Syd is being held in Prison Oubliette in the Mines Crater. You must go there and meet with him. Target Prison Oubliette from the message and get through Midway to the Mines. The prison will be pretty much in front of you. The Laz forces will attack you. I generally outrun them and use flares and holograms as needed. Prison Oubliette's hangar door is facing the crater wall. Make the turn and enter the prison as quickly as you can. Inside you'll see a video where Syd tells you to go to Lazarus Hightower where Xavier Lazarus lives. I'm not going to tell you what happens to Syd. Time to leave and head Downtown. NOTE: The prison officials will stock your pod with five units of bodyparts if you still have your pod attatched. These bodyparts will attract pirates and you already have Laz and now Klamp enemies. If you enter Prison Oubliette with a pod remember to jettison your cargo with the "J" key immediately upon leaving the prison. Lazarus Hightower -- Before leaving Prison Oubliette target Lazarus Hightower from a message recieved much earlier in the game. The message was recieved shortly after the *Decoy Required* message. The sender is Lazarus Hightower and the subject is *Translation*. Target the sender. Don't worry if you've deleted the message. I've got detailed instructions on finding and entering the Hightower here. Leave the prison and head Downtown via Midway and Gamma. Bear right upon exiting the tunnel into Downtown. The Hightower is Downtown about halfway between the entrances to the Gamma and Port tunnels near the crater wall. It's a hangar on top of a long, long column. The hangar door is right at stall level and faces the crater wall. I use directional thrust very carefully to enter the hangar. It may take a few attempts your first try. I've not been attacked while trying to enter it, so don't rush things too much. Inside Xavier Lazarus gives you a nice speech and tells you that a specially fitted, unarmed Moth is available that can take you into the Port Crater and to the aliens who will take you off Titan. He also translates the garbled messages you've been recieving. You might be interested in reading them before leaving. Because the Hightower's hangar door is at stall level, it's difficult to get into. I've got a detailed approach here. This opens in a separate window. In the example's screenshots, I'm using a Silver-Y with Cell #1 and Engine #1 just to show it can be done. (Check the HUD in the screenshots to check my honesty.) It helps to have a Fusion Cell or at least a Cell #3. The better your Cell, the higher you can go before stalling. Making the Hightower with a Cell #3 or better in a Neo-Tiger is a snap. Click here to get a detailed walkthrough of entering Lazarus Hightower. I did it with a Silver-Y fitted with a Cell #1. If you haven't already targeted and saved Syd's Workshop, don't worry. Start out by exiting Lazarus Hightower and pointing your nose down to avoid a stall. Now bear right and go back toward the Gamma Tunnel. Bear right again an pass Breaker Maker 2 on its right (it will be to your left). You'll see a small cluster of hangars including the "Debriefing Zone". Syd's Workshop is at the back of this complex from this approach. The Final Run -- You'll notice an empty Moon Moth in Syd's hangar. This is the specially fitted Moth you'll need to return to the Port Crater. Get out of your Moth and into the Moon Moth. Target the Abandoned Terminal from one of the now translated messages or your buildings menu. Take a deep breath. Evey ship in Misplaced Optimism is going to be gunning for you. Good time to save your game. Leave the hangar and go to full throttle. Bear slightly left to the Gamma tunnel. 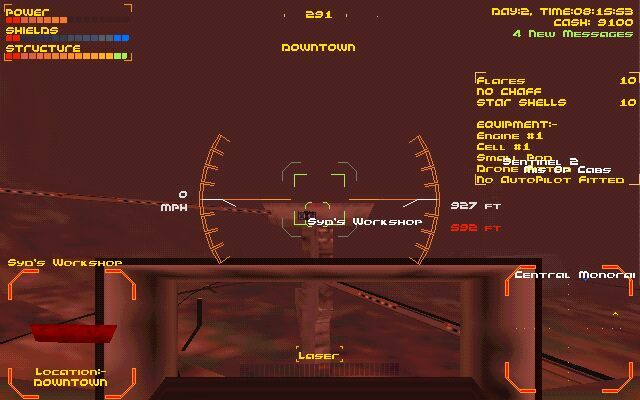 Your navigational computer will try to send you through Alpha. That's a long and dangerous way around. Don't sweat a few hits. Just stay at full throttle and don't beat yourself to death in the tunnels. Zip right back to the Port Crater through Gamma, Midway, and the Mines. Be careful not to hit ships upon entering and exiting tunnels. Stay at full throttle. Ignore your attackers. Enter the Port Crater and head straight for the Abandoned Terminal. The hangar door is on the side facing you. Enter the hangar and YOU'VE MADE IT !!! Just relax and watch the closing video. It's really good. Sort of a sentimental thing.